I’ve thus far featured a couple of films during Literary Adaptation Month that have stayed pretty close to the source material. This week however, I’ll be watching an adaptation that uses the original book as inspiration, but then veers wildly, excitingly off course. A long-time favorite film of mine is Alfonso Cuarón’s 1998 version of Great Expectations (DVD/Download). Based on the novel by Charles Dickens, this film captures the classic Dickensian struggles of wealth vs. poverty and good vs. evil, while updating it for the modern era. In the Cuarón version of Great Expectations, Pip is renamed Finn, and played by Ethan Hawke. A very bored Gwyneth Paltrow plays Estella, the focus of his unrequited love. Robert DeNiro’s portrayal of convict Lustig (Magwitch) is still a career highlight to me, and Anne Bancroft shines as Ms. Dinsmoor (aka Miss Havisham). I absolutely want to be Ms. Dinsmoor when I get old, sitting in a Florida mansion, drinking martinis, wearing crazy wigs and listening to Bossa Nova records. Strike that- can I just start that life now?? 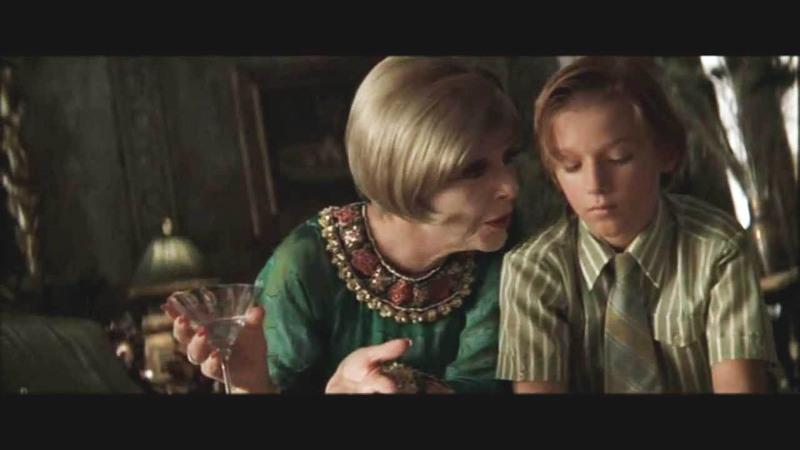 In this version, Finn becomes an artist (side note: I’m madly in love with the Francesco Clemente paintings and drawings done for the film), and Lustig’s secret patronage lures him to New York, and Estella. Great Expectations relies on visuals a great deal, and it’s this beauty (and the lovely words written by David Mamet in the voiceover narrations) that keep me coming back time and again. 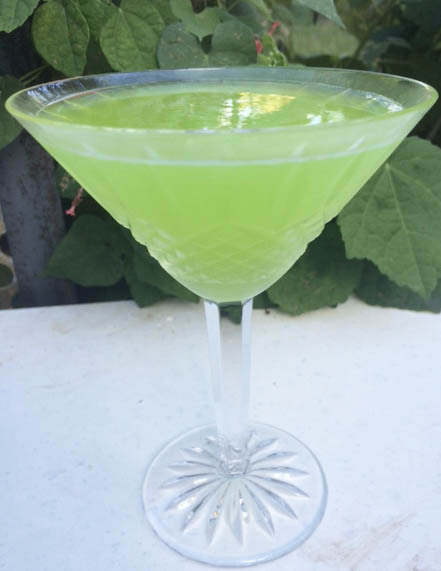 For my drink this week, I’m picking up on that green motif and mixing up a martini that Ms. Dinsmore would surely be sipping in her gilded bedroom. While watching Great Expectations, I recommend drinking a Paradiso Perduto. Mix all ingredients in a cocktail shaker filled with ice. Shake until chilled. Strain into a chilled martini glass. I’m not usually one for radioactive-looking cocktails, but this one is actually quite tasty. And with such a visually-focused film, why not match it? There have been other Great Expectations adaptations, and I expect there will be several more in the future, but this one will always be special to me. Modern art, martinis, and Donna Karan- what’s not to love? Chicka-boom! Posted in Dramas and tagged Anne Bancroft, Charles Dickens, Ethan Hawke, Francesco Clemente, Great Expectations, Great Expectations cocktail, Gwyneth Paltrow, movie cocktails, Robert DeNiro. Bookmark the permalink.